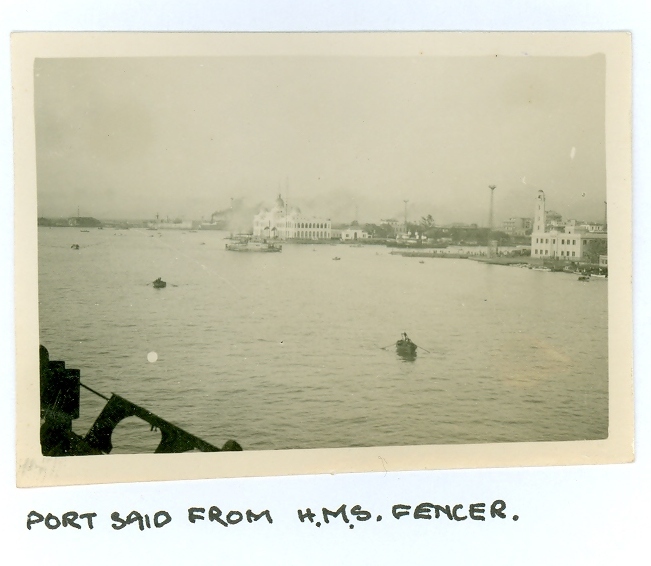 Ron Ryder was a former Petty Officer onboard the HMS Ausonia between the 22nd November 1945 and 8th April 1946. 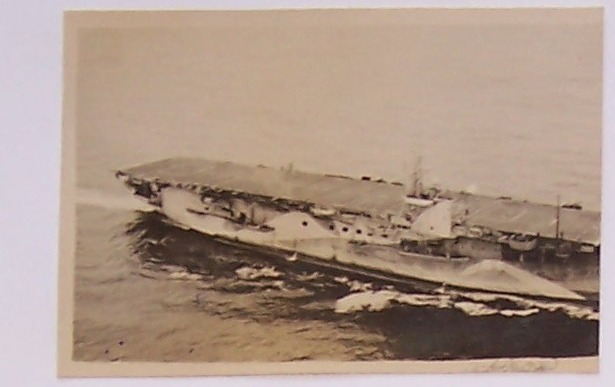 This collection of photographs started my interest in the ship. 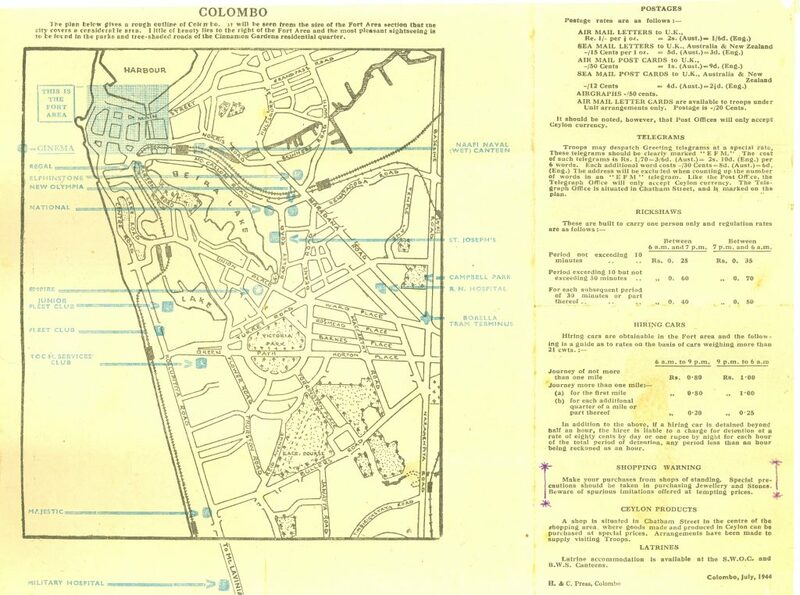 A map of Colombo Harbour issued to serviceman when entering the city. 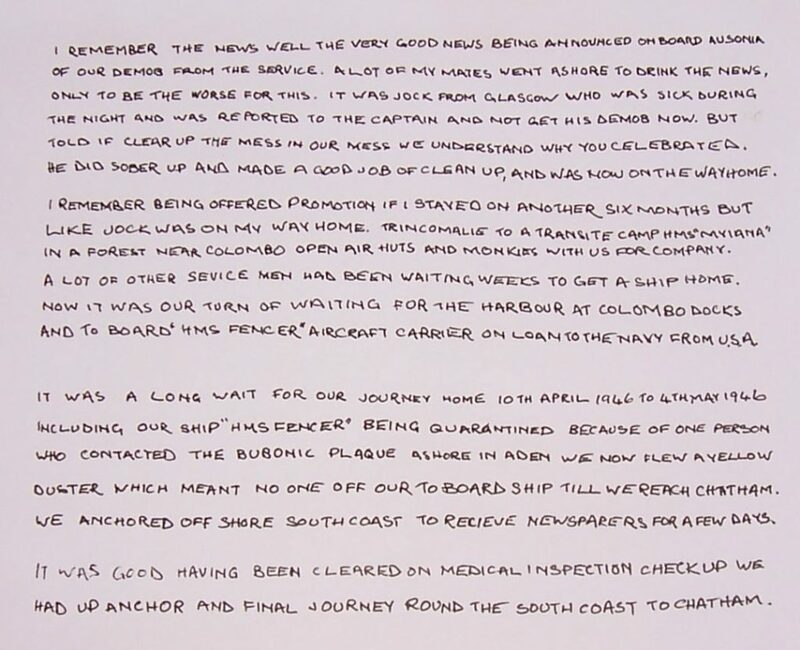 It not only gives directions to Royal Navy establishments but also has advice and instructions. 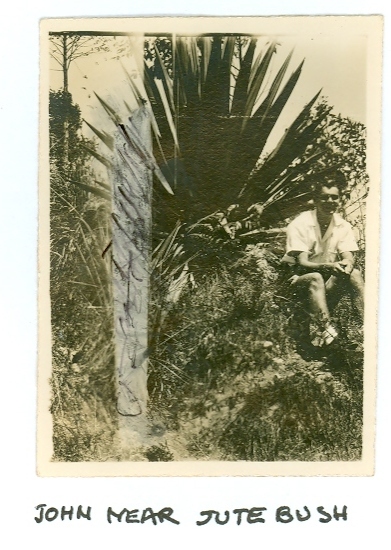 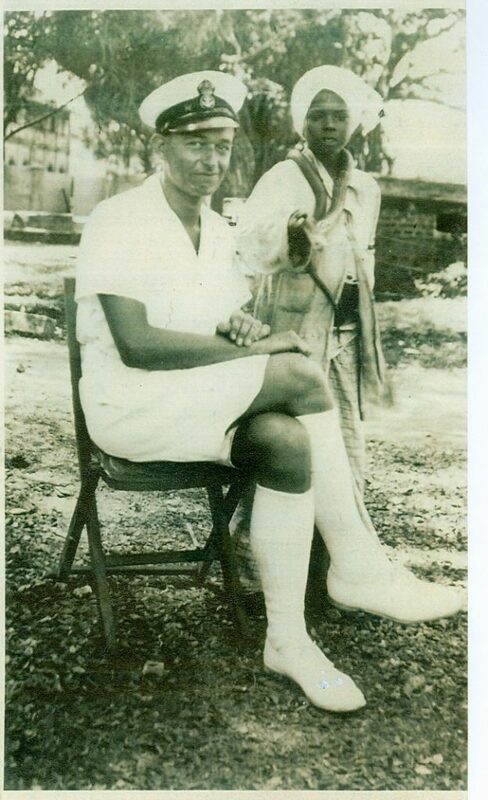 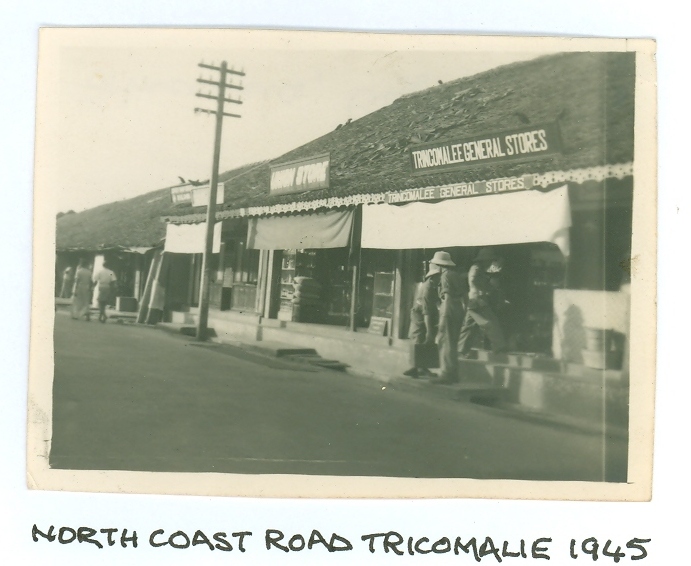 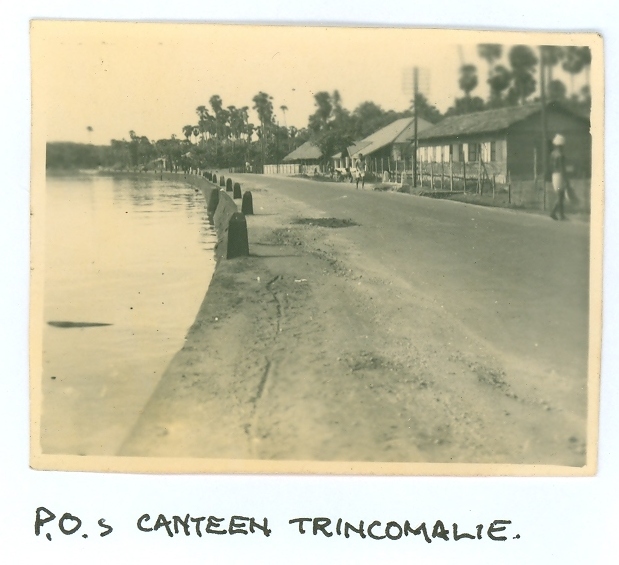 This photograph of Petty Officer Ryder in his “whites” was taken while on shore leave at Trincomalee. 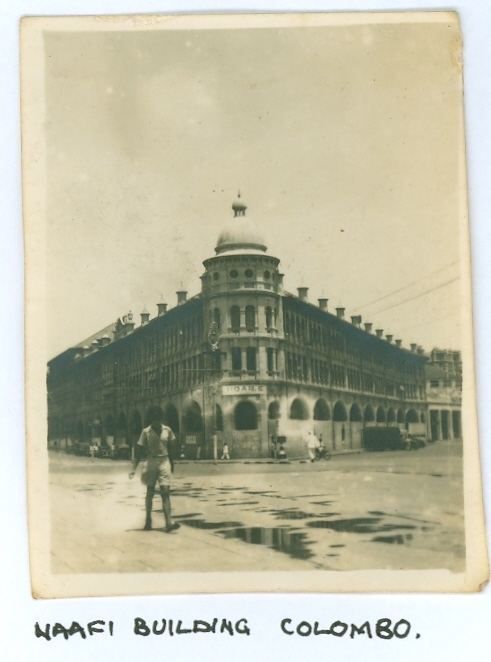 It was taken by a local photographer who had a box about 3 feet square which took the picture, developed and printed it while he waited. 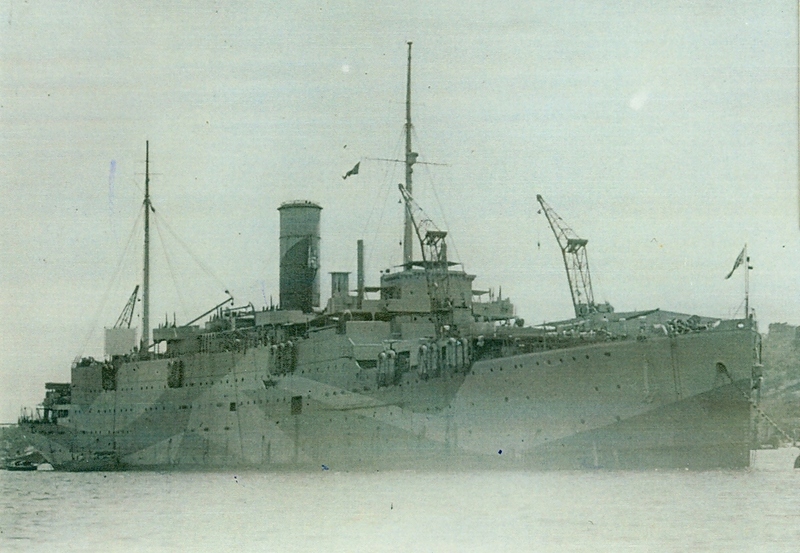 HMS Ausonia in Trincomalee Harbour. 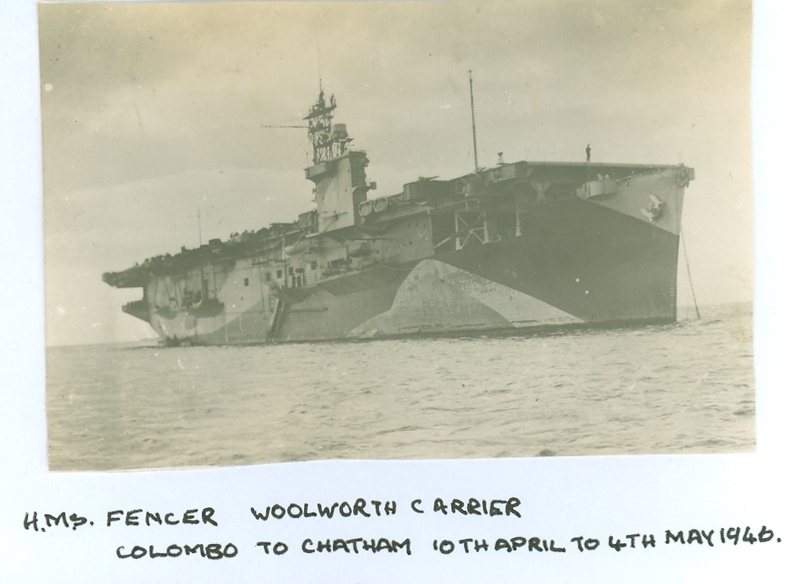 On the stern of the ship can be seen the temporary white screen used for showing films at night. 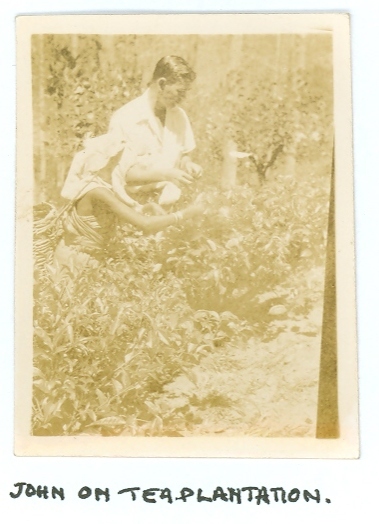 One of his jobs was to look after the projector and sound equipment used for the shows. 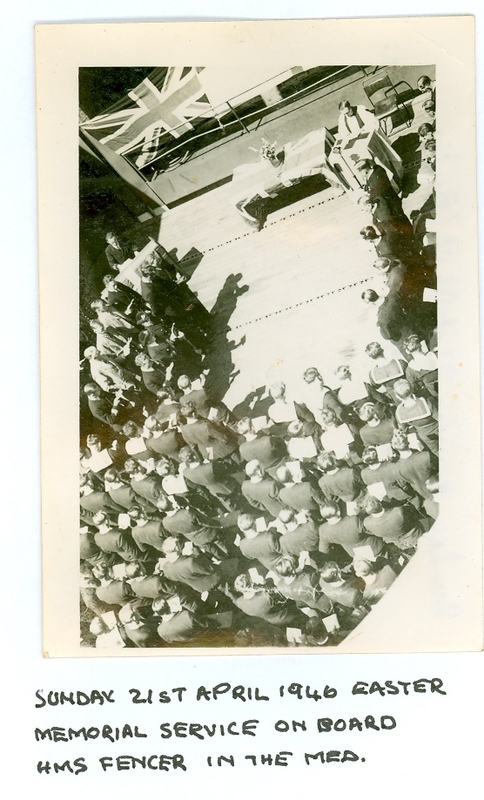 Photograph of Ron (far right with his hands on his knees) with some of his shipmates on the top deck of HMS Ausonia, December 1945. 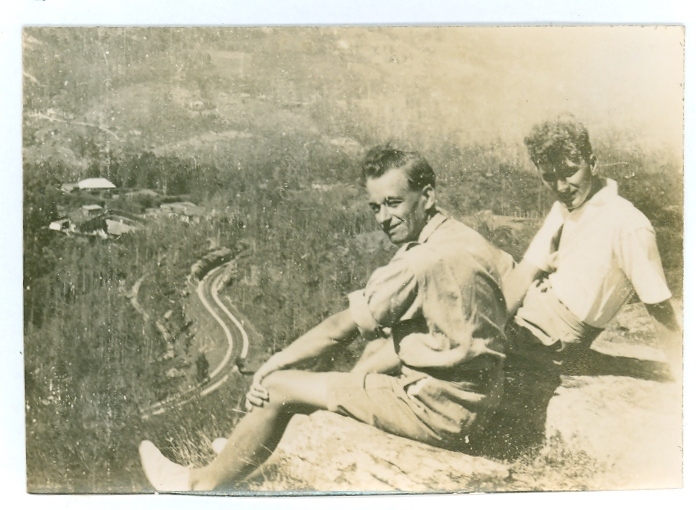 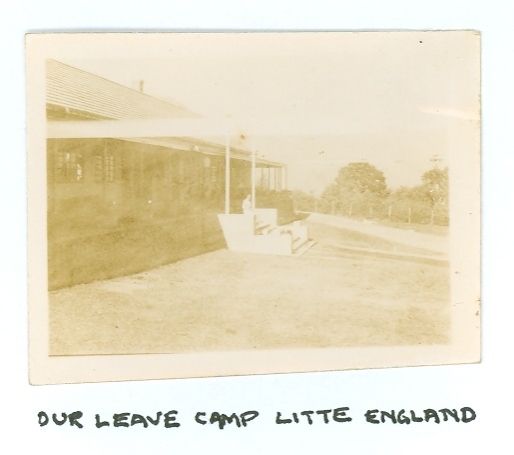 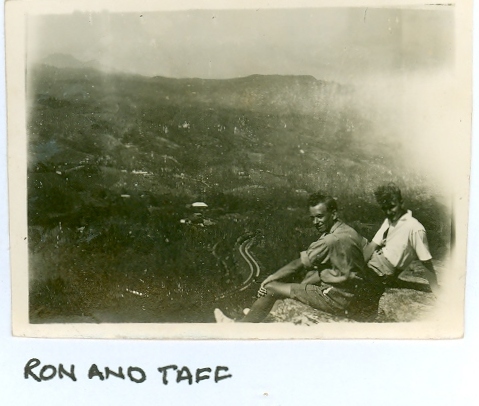 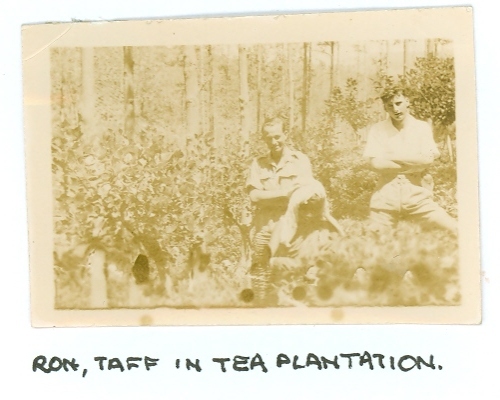 While at the leave camp up in the mountains of “Little England” Ron took many photographs. 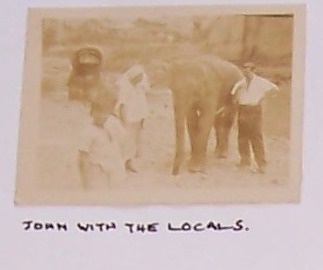 This photograph was taken at Kandy by a lake full of turtles. 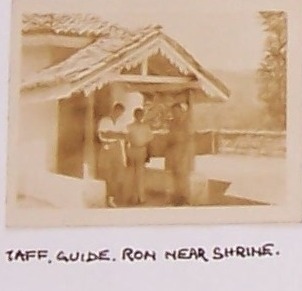 Ron is second from the left. 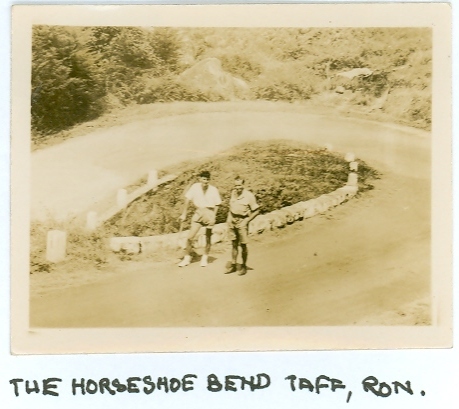 While at the leave camp up in the mountains of “Little England” Ron took many photographs. 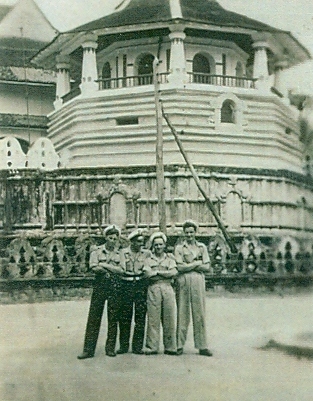 This photograph was taken at Kandy on the opposite side of the road to the lake in front of the temple of the Tooth. 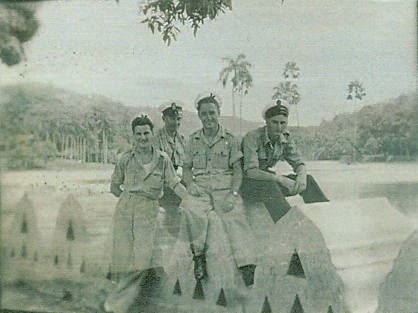 Ron is second from the left. 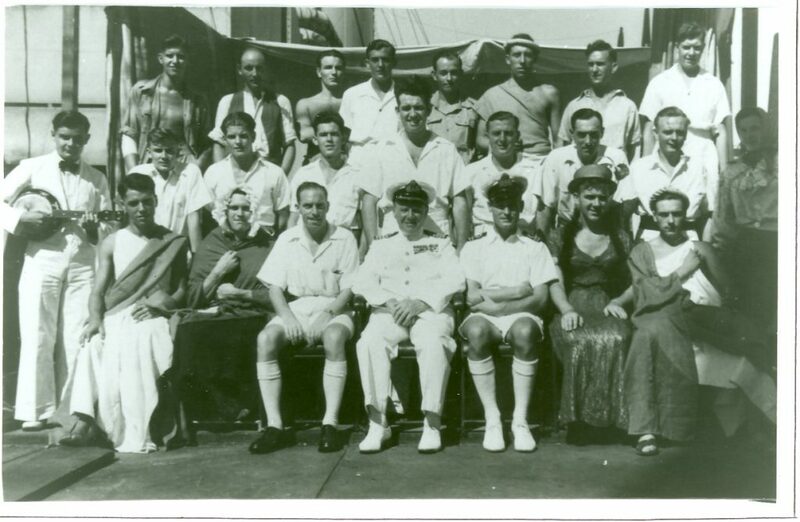 Petty Officer Ryder (centre, rear row) with the ships concert party. 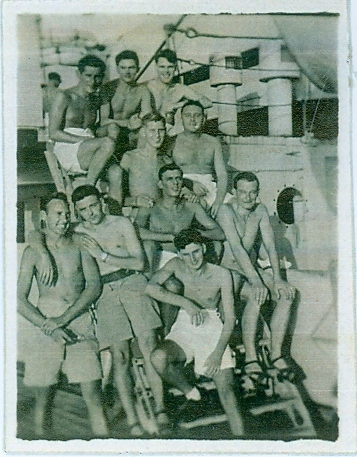 The Captain of HMS Ausonia is seated in the centre of the front row. 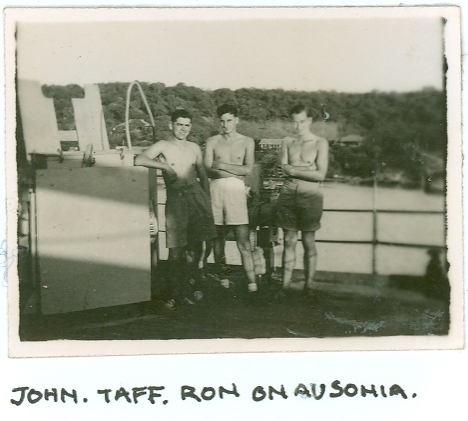 Ron (far right) with his mess mates, John and Taffy standing next to one of the 20mm Oerlikon anti-aircraft guns on the boat deck of HMS Ausonia. 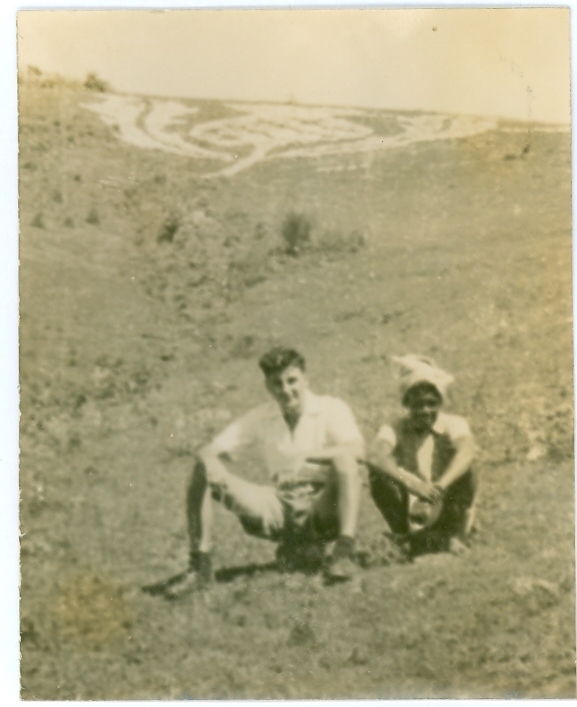 Ron and Taff on top of the mountain at Niyatalawa.